The Pen Pal will adhere to most flat surfaces. Just peel the backing off and stick the pen holder in the desired location. It's that simple! Pen Pal uses a strong adhesive so be sure to take the time to carefully position your Pen Pal in the desired location. Once applied it is not ideal to move the Pen Pal to a new location. Once your Pen Pal is properly adhered to a surface it is ready to hold your pen, pencil or marker. It is designed to hold various pen sizes up to a standard size Sharpie marker. The easiest way to insert your pen into the Pen Pal is to install it first at an angle then lay it down flat into the holder. If you must remove your Pen Pal carefully peel it off of the surface to which it is attached. 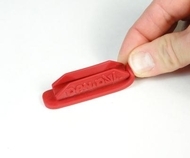 You can then remove any remaining adhesive that may be on the surface by rolling it into a ball with your finger or finger nail as shown in the image to the left of this text. Any remaining residue can be easily removed by applying a small amount of WD-40 to a paper towel and then rubbing the effected area. You can order new Adhesive Backings if you wish to move your Pen Pal to a new location!